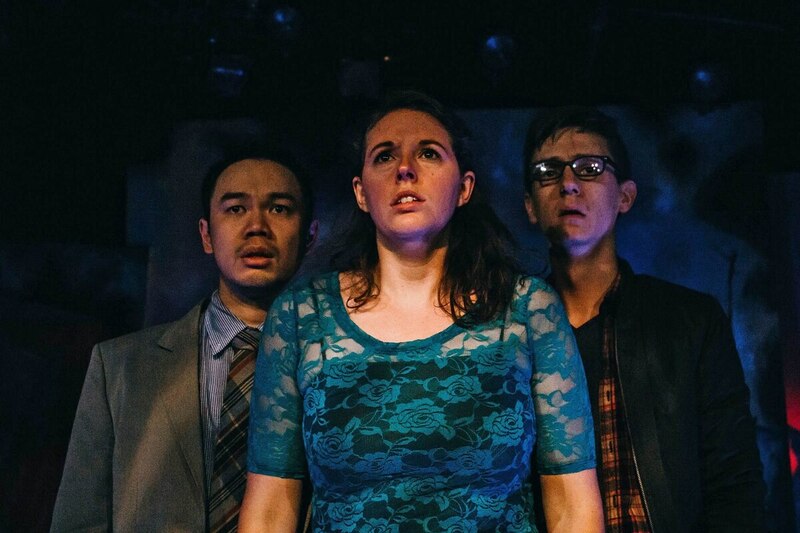 Characters navigate virtue and sin in this Theatre Vertigo play. A Map of Virtue opens with two people, Sarah and Mark, seated, facing the audience, describing what it was like when the birds descended on the diner. "It was just like that Hitchcock movie, but it wasn't a movie," says Sarah (Paige Rogers). "It was happening and it was really frightening." "Some kind of omen," replies Mark (Samson Syharath), "I thought." Strangers, Sarah and Mark did not meet that time in the diner, but the two noticed each other and remembered those unspoken glances during their next encounter. We the audience take these happenings in stride. Theater is the realm of coincidence, is it not? Sarah and Mark cross paths later in Ireland, on a cliff overlooking the sea. What are the odds? They sit next to each other but don't speak to one another. Mark tells us about a tiny Bird Statue (the play's narrator, Jacquelle Davis) that's always in his pocket, like the moment in the diner. He leaves it on the bench for Sarah. The play proceeds like this, with Sarah and Mark talking about the elaborate set of circumstances and near-misses that eventually lead to their meeting. Meanwhile, the Bird Statue introduces each new scene by naming one of the seven virtues, like curiosity and loyalty. Playwright Erin Courtney is acutely aware of the expectation implicit among modern playgoing audiences: When they're shown a coincidence, it must be meaningful, like a twee Chekhov's gun. Courtney invites the audience into a world of comfortable convention—quirky, witty characters bejeweled with friendly, weird details, and a story coated with a warm veneer of magical realism. We gladly get close and peer right in; and then what happens is like one of those early internet videos where a car is driving along peacefully, only to suddenly give way to a ghoulish visage screaming in your face. A Map of Virtue makes a sharp turn in the middle third of the play referred to in the text "Middle of the Night: when bad things happen sometimes." I wouldn't dream of ruining the surprise, but I will say it's jarring and tonally inconsistent with what we had experienced until then. And that's exactly the point. This twist in the turn of events is tense and unsettling. Whereas the other parts of the play are presented interview-style—the characters give their impressions before or after everything happened—"Middle of the Night" exists in present time. The characters explore their surroundings, unsure of what will happen, terrified as we in the audience are. One interesting thing about this sequence is that, by my estimation, it lasts 20 to 30 minutes, but only about one-quarter of it contains any dialogue. Plays are, by nature, verbose, so this frightened silence and the characters' shallow breaths stand out, emphasizing the desperate mood. Credit also goes to Kelly Terry for a lighting design full of ominous silhouettes and skulking shadows, as well as to sound designer Chris Beatty, who knows the right time to deploy a squeak or a screech to make your hair stand on end. A Map of Virtue is neatly divided into three passages—the two I've mentioned and a third, which deals with the fallout of the events during "Middle of the Night." Alone, these segments would be meaningless, yet they can barely exist together in the same play. Each act is a distinct mood that shares characters and motifs, like psychic echoes of each other. SEE IT: A Map of Virtue plays at Theatre Vertigo, 2110 SE 10th Ave., theatrevertigo.org. 7:30 pm Thursday-Saturday, Nov. 15-17. $5-$20.